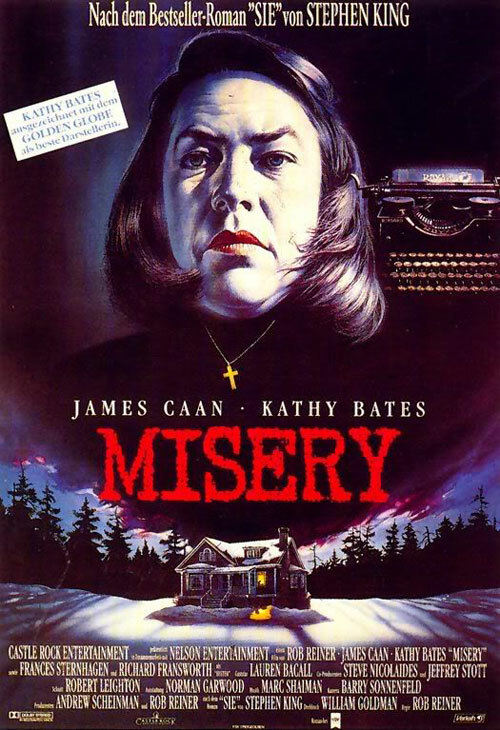 My choice and favorite film for Stephen King week is Misery. The film tells the story of best-selling author Paul Sheldon (James Caan) who on one snowy day crashes his car and is left for dead. To Paul’s luck, a passerby comes and saves him and brings him back home. When Paul awakes the next morning, he finds out his savior is a woman named Annie Wilkes (Kathy Bates). Not only is Annie a nurse, but she also just so happens to be Paul’s number one fan and is obsessed with his Misery Chastain novels. As time goes by, Paul starts to feel much better and is ready to leave. However, his savior Annie just isn’t ready for that yet. What’s in store for Paul is one nightmare he will never forget. Misery is one solid thrill ride that keeps you tense all the way through until the big showdown between Paul and Annie. As the film progresses, the more we start to see just how insane Annie becomes, and the treatment of Paul becomes more and more disturbing. This is my favorite Stephen King flick because it revolves around Annie’s behavior in order to freak out its audience. It doesn’t need music, or gore, or anything other horror films have. The viewer can almost be in the same mind-set as Paul as he endures his torture. Kathy Bates totally deserved her Oscar for the role, she does an amazing job changing behavior from sweet innocent fan, to totally insane and obsessed fan.